Subsidence is a persistent problem in some parts of the UK: around 35,000 domestic insurance claims (often complex and protracted) are made each year, which cost up to £550 million. 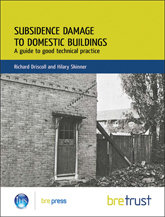 This book provides authoritative guidance to best practice in the technical and engineering aspects of subsidence damage to domestic buildings, and covers investigation, diagnosis, repair, prevention and mitigation of building cracking and deformation. It reviews current information and provides a clear, logically structured baseline of technical guidance for investigators. Key BRE publications on soils, site investigation and foundations are included in pdf format on a CD-ROM accompanying the book. BRE publications on the CD-ROM are: FB1, IP4/93, IP7/06, DG240, DG251, DG298, DG318, DG343, DG344, DG348, DG361, DG381, DG386, DG412 and DG475 (included as a ZIP file for downloads). FB13, foundations, housing, tree roots, cracks, underpinning.